Things got ugly in Texas yesterday, with Rougned Odor clocking Jose Bautista in the jaw after a hard slide. The Red Sox are putting up runs at a record pace, hitting double-digits five times during their seven-game homestand against AL West bottom-feeders Oakland and Houston. It is a frightening thought that if they get any kind of pitching, they are going to be a powerhouse all year. David Price turned things around, lowering his ERA to an even 6.00. Boston is simply outslugging its opponents and if and when Price and Clay Buchholz return to form, it could turn the American League East into a one-man show. Think anyone else going in hard to second base against the Rangers would have set off the kind of fireworks that Jose Bautista did yesterday? 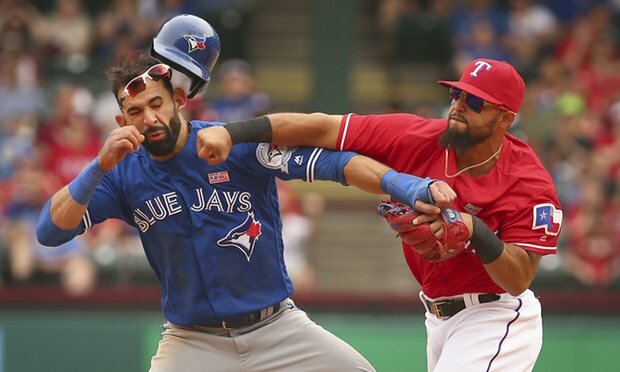 It was hardly an accident that Rougned Odor’s fist made line-drive contact with Bautista’s jaw, with Bautista’s hard slide turning yesterday’s game into a WWE brawl. The Rangers won the game, 7-6, and the series as well. But their most important victory, at least in the eyes of their fans, may have been in the fracas that has been a mere formality since Bautista’s bat flip in Game 5 of last year’s ALDS. The Pirates did steal a game at Wrigley Field behind a dominant outing from ace Gerrit Cole, but that’s seemingly what it will take to beat the Cubs this year. At 27-9, Chicago is not only meeting its lofty expectations, it’s shattering them. No, the Cubs won’t win the 120-or-so games they are currently on pace to, but the NL Central appears to be over before it even started. Jake Arrieta hasn’t lost since being on the wrong end of Cole Hamels’ no-hitter late last July, and even when he isn’t flawless, the offense always seems to give him plenty of support. The bullpen is still something of a question mark, but it’s also an area that Joe Maddon has been masterful dealing with from his time in Tampa Bay. Right now, it appears the only team that can stop the Cubs are the Cubs. Speaking of exceeding expectations, how about Pete Mackanin’s Philadelphia Phillies? Projected by many to hover around 100 losses, the Phillies are channeling their inner-2012 Orioles by winning one-run games at an absurd. Philadelphia is 14-3 in one-run contests, six more wins than the next closest teams, San Francisco and Seattle, who have eight apiece. For those that take run differential seriously, there will be the theory that it will come crumbling down soon in the City of Brotherly Love. But give credit to the Phillies, who have blown it all up and started over after their five-year reign of supremacy atop the National League East. At 22-16, the Phillies have a minus-30 differential, while Mets — 21-16 and a half-game back of the Phils — are at plus-34. St. Louis, at 20-18 overall, is at plus-49 yet is just 2-5 in one-run games. It’s still early, but the Phillies are proving that it’s not about style points. I tweeted out to the stats folk of MLB, but was unable to get any further details on whether the Giants’ four-game road sweep of Arizona had any kind of historical significance. San Francisco’s sweep was payback for Arizona going into AT&T Park and taking all four from the Giants last month, meaning all eight meetings thus far have been won by the road team. But aside from the historical angle, maybe the Giants are getting their act together (it is an even-numbered year, after all). After Santiago Casilla’s flare-up with Bruce Bochy was nipped in the bud, Casilla bounced back to earn a save the next day. The team is getting strong starting pitching and timely hitting, with the bullpen holding its own in the absence of Sergio Romo. The Giants are fifth in baseball in runs scored, and are also playing stout defense, as they are tied for fourth in fielding percentage. Be the first to comment on "MLB Roundup: Week 6"